Berg LK, EI Kassianov, CN Long, and DL Mills. 2011. "Surface summertime radiative forcing by shallow cumuli at the Atmospheric Radiation Measurement Southern Great Plains site." Journal of Geophysical Research – Atmospheres, 116(D1), D01202, 10.1029/2010jd014593. Fair-weather cumuli are ubiquitous, occurring over large portions of both the continents and trade wind regions of the oceans, and have a substantial impact on the surface radiation budget. Compared to other cloud types, cumulus properties have large variations in both time and space, and these variations are poorly captured by current large-scale models. 1. How large are contributions of the shortwave and longwave components to the net CRF at the surface? 2. What is the magnitude and observational frequency of the positive shortwave CRF at the surface? 3. What is the relationship between the sky cover and the total amount of shortwave and longwave energy deposited at the surface over a period of time? The summertime averages of the shortwave and longwave components of the hourly average CRF at the surface are found to be -45.5 W m-2 (out of 612 W m-2 for clear sky conditions) and 15.9 W m-2 (out of -105 W m-2 for clear sky conditions), respectively. Thus, the shortwave component is nearly three times larger than its longwave counterpart, and the presence of shallow cumuli lead to a net cooling of the surface. Both the hourly average shortwave and longwave CRF were found to increase in magnitude with increasing cloud fraction. The inhomogeneity of the cumulus properties is responsible for many cases with positive shortwave CRF, which are associated with cloud-induced enhancement of the diffuse irradiance. For such cases, the cloudy-sky instantaneous values of the diffuse irradiance can exceed the corresponding instantaneous clear-sky values by as much as 225 W m-2. The positive and negative components of the shortwave CRF are characterized by small-scale fluctuations; about 95% of them are less than 20-minute duration. In comparison with the positive component of shortwave CRF, the negative component has larger amplitude (up to 800 W m-2). Although temporal averaging reduces the amplitude of the positive CRF and its population, nearly 20% of all 1-hr averages of CRF were positive. The neglect of the positive component of the forcing would increase the summertime average CRF by nearly 24% (from 45.5 W m-2 to -59.5 W m-2), The total amount of shortwave and longwave energy deposited at the surface (TED) is the amount of energy that is available for partitioning between sensible, latent, and soil heat flux. Both the change in shortwave TED and the change in the longwave TED have a non-linear dependence on the fractional sky cover, with the largest values occurring at intermediate sky cover. Two competing factors lead to this behavior of the shortwave and longwave TED. The first factor is the magnitude of CRF, which increases with increasing sky cover. The second factor is the number of occurrences of any cloud amount, which, for shallow cumuli, decreases with increasing sky cover. These two competing factors lead to the observed non-linear behavior of the shortwave and longwave TED. Small and optically thin shallow cumuli are frequently observed over land and ocean. The geometrical and optical properties of cumulus clouds exhibit large variations over both time and space and lead to a large amount of variability of the radiative properties at the surface. 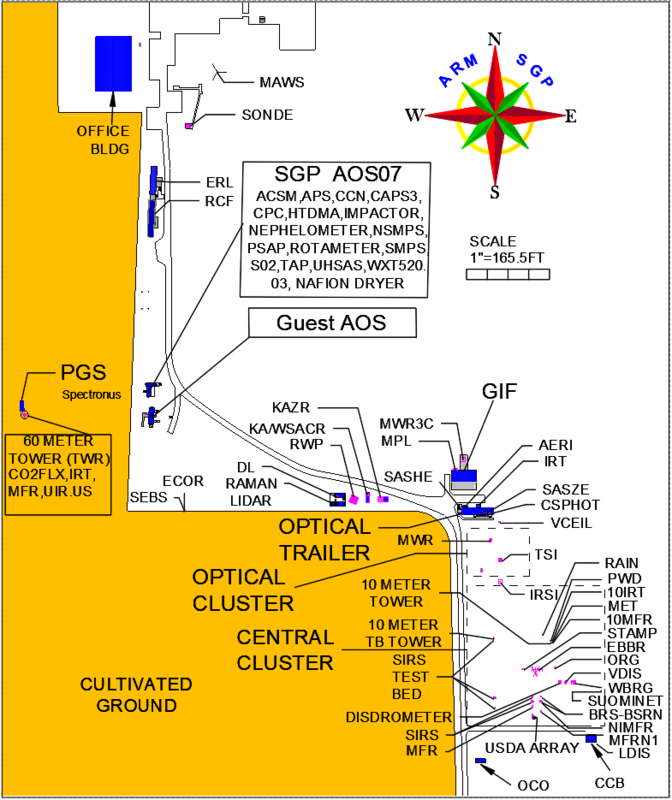 This study describes the impact of shallow cumuli on the shortwave and longwave components of the CRF at the surface using data collected during eight summers at the ARM SGP site. While the observed quantitative impact on the surface CRF is representative of local conditions at the study site, the qualitative impact, namely the important role of shallow cumuli in the Earth’s surface energy budget, is expected to be applicable at a wide range of locations around the globe. In addition, the data set developed as part of this study is a useful tool for evaluating models of the atmosphere. Histogram of hourly average shortwave CRF (black) and longwave CRF (red) for all periods with shallow cumuli. (a) Hourly average shortwave CRF (circles), binned shortwave CRF (squares); (b) total number of hourly averages for each sky cover bin; and (c) the change in shortwave TED as a function of sky cover for all hours with shallow cumuli. Line in (a) indicates best-fit polynomial to binned values of shortwave CRF.